The potential misuse of advances in life sciences research is raising concerns about national security threats. 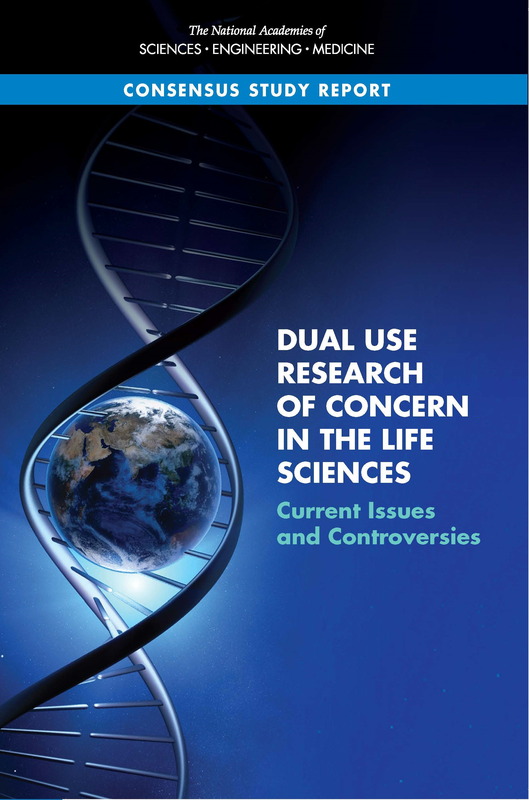 Dual Use Research of Concern in the Life Sciences: Current Issues and Controversies examines the U.S. strategy for reducing biosecurity risks in life sciences research and considers mechanisms that would allow researchers to manage the dissemination of the results of research while mitigating the potential for harm to national security. The open publication of fundamental scientific research is consistent with general U.S. policy as elaborated in NSDD-189 (National Policy on the Transfer of Scientific, Technical, and Engineering Information) and followed by federal research agencies and scientific journals. However, the 2012 controversy surrounding the publication of two scientific papers that demonstrated the capacity for mammalian transmissibility of a lethal H5N1 avian influenza strain highlighted research where access to research data raises significant biosafety and biosecurity concerns. Several years later, it remains unclear as to whether there are practical mechanisms or approaches for managing such dual use research of concern (DURC) and, specifically, how to deal with situations where there is a pressing need, for public health reasons, to publish research findings while limiting, due to national security concerns, the dissemination of certain details that ordinarily would be published. This is especially true in cases where an initial assessment of proposed research does not anticipate results that would warrant such consideration. An ad hoc committee under the auspices of the Committee on Science, Technology, and Law will convene a workshop jointly with the Board on Health Sciences Policy's Standing Committee on Health Threats and Workforce Resilience to explore options for communicating the results of dual use research of concern while protecting certain information. The workshop will review existing mechanisms for control of information sharing such as retraction, FOIA, classification, and export controls, as well as First Amendment issues and the applicability of free speech to a scientist's right to publish research results. Commissioned papers presented at the workshop will offer options for dissemination of dual use research results that might be adopted. This website contains unedited verbatim presentations made by meeting participants as well as individually authored papers. Neither are official reports of the National Academies of Sciences, Engineering, and Medicine. Opinions and statements included in these materials are solely those of the individual authors. They have not been verified as accurate, nor do they necessarily represent the views of other participants, the committee, or the National Academies. *Joseph Kanabrocki, "Biosafety, Biosecurity and Dual-Use Research of Concern"
*David A. Relman and Michael Imperiale, "Options for Management of Potentially Dangerous Information Generated by Life Science Research"
*Sam Weiss Evans, "Constructing New Security Concerns in the Life Sciences"
*Duane Lindner, "Control of Sensitive Information in a National Security Context"
*Piers D. Millett, "Gaps in International Regulation of DURC"
*Kim Strosnider and Doron Hindin, "The Role of Export Controls in Regulating Dual Use Research of Concern"
*Joseph Kanabrocki, "Biosafety and Biosecurity in the Realm of Dual-Use Research of Concern"
*Michael Imperiale and David A. Relman, "Options for Management of Potentially Dangerous Information Generated by Life Sciences Research"
*Sam Weiss Evans, "The Construction of New Security Concerns in the Life Sciences"
*Tim Stearns, "Moving Beyond Dual Use Research of Concern Regulation to an Integrated Responsible Research Environment"
*Duane Lindner and Winalee Carter, "Control of Sensitive Information: Policy, Procedure, and Practice in a National Security Context"
*Piers D. Millett, "Gaps in the International Governance of Dual-Use Research of Concern"
*Doron Hindin, Kim Strosnider, and Peter D. Trooboff, "The Role of Export Controls in Regulating Dual Use Research of Concern: Striking a Balance Between Freedom of Fundamental Research and National Security"
*Gerald L. Epstein, "Current U.S. Policy on Publication of Dual Use Research of Concern"
See also Elisa D. Harris' statement to the committee. Dual Use Research of Concern in the Life Sciences: Current Issues and Controversies was released via a public webinar on September 14, 2017. This project was sponsored by the Alfred P. Sloan Foundation, the Federal Bureau of Investigation, the Gordon and Betty Moore Foundation, and the Burroughs Wellcome Fund.